As the weather becomes increasingly hot in summer, ice cream has become the favorite food for a lot of people. It’s almost impossible to walk down the street in August without hearing the familiar call of the ice cream truck. The sound brings to mind the endless possibility of summer: water balloon fights, barbecues, cookouts, family reunions and lazy weekends. It is true that ice cream can bring us a cool and refreshing feeling in the hot summer, but not everyone can have that sweet and creamy taste of ice cream. For some people who lead lives without milk— it’s a sad reminder of what’s missing from their summer: a good non-dairy ice cream. Instead of waving down that ice cream, take a trip instead to the frozen aisle of nutrition store in Pembroke Pines. We have a variety of flavors from soy, coconut milk varieties, sorbet and banana vegan ice cream alternatives all occupy the shelves. Choosing the best selection depends mostly on your taste bud’s interpretation. Some people like their vegan ice cream creamy, while others like the flavor of a low-calorie fruit-based option. No matter what your preference is, many non-dairy free frozen treats will satisfy your sweet tooth. Going vegan doesn’t mean you have to give up creamy, rich ice cream in a variety of flavors. Many vegans turn to ice cream made from coconut milk. Chocolate lovers, your dream has come true! Your taste buds won’t resist this creamy and smooth frozen dessert. We have this healthy alternative that is chock full of good fats provides a milk-like texture with a naturally sweet coconut flavor. This classic ice cream flavor goes vegan with a fruity, sugar, and flavorful dessert loaded with pure goodness. 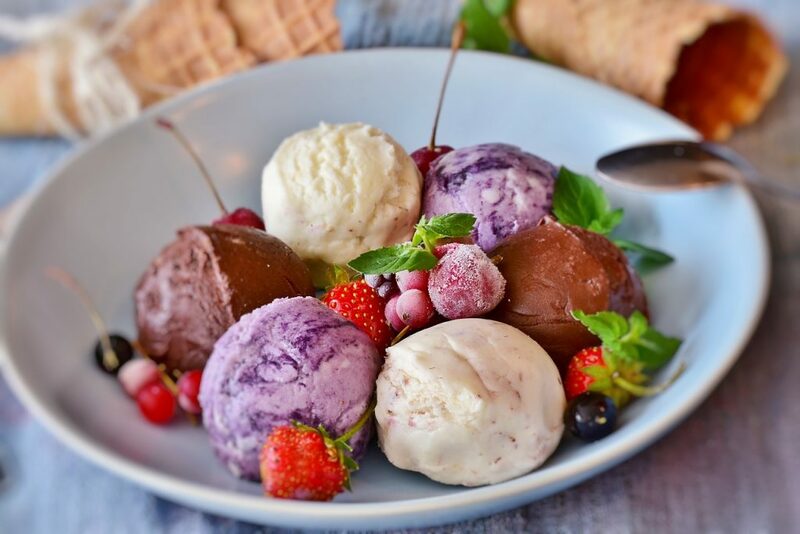 While the creaminess of soy and coconut milk are favored options for those looking for a true ice cream consistency, the fresh taste and lightness of a sorbet ice cream made with in-season fruit can’t be beaten. Sorbet is a fruity frozen dessert that is a low-fat and cholesterol free alternative to ice cream, sorbet is made from frozen pureed fruits, sugar and water, resulting in a dense and very flavorful dessert. The most popular ice cream alternative to hitting the shelves at a nutrition store in Pembroke pines comes from organic soybeans. Soy-based ice cream has a lower fat content than its milk-based counterpart and comes in a variety of popular flavors. The taste and texture of soy alternatives perfectly replicate the rich creaminess of traditional ice cream, which is great news for lactose-sensitive individuals. If a milk-based scoop gives you awful tummy-ache after you eat it, soy-based ice cream may alleviate the issue. Call it banana soft serve, call it “nice” cream, call it vegan ice cream—whatever you call it if you haven’t tried this delicious banana ice cream at home, stop what you are doing right now and go buy some at a nutrition store in Pembroke Pines! You got to try this. The bananas make a creamy base that melts on your tongue, making you burst out in song. This simply delicious banana ice cream will have you wanting more. Those looking for an unconventional way to get their ice cream fix can find it by using a monkey’s favorite fruit. The natural fruit base of bananas is perfect for those following a raw vegan diet, too. Anyone can enjoy banana ice cream too, because, in its pure form, it contains no added sugar. If you are looking to make a quick fix, slice a few bananas, throw them in the freezer, and then combine them with cocoa powder and blend them to the consistency of soft-serve ice cream. If you desire more sweetness, toss in a pinch coconut sugar—a healthy alternative sweetener. Many people don’t realize that the delicious world of vegan ice cream exists. If are like others who can’t have a diary or are looking to going vegan, prepare to be blown away! We have a variety of mouthwatering ice creams that can be purchased at our store. Here at a nutrition store in Pembroke Pines, we will have everything you need to live your healthiest, happiest life. Whether you’re a vegan or looking for a substitute ice cream, shopping for healthy desserts is easy when you know where to go. Find your favorite healthy alternatives and substitute foods at Nutrition Smart.